Buddhism reached Korea in the late 4th century, brought by itinerant monks and merchants, mainly from China. 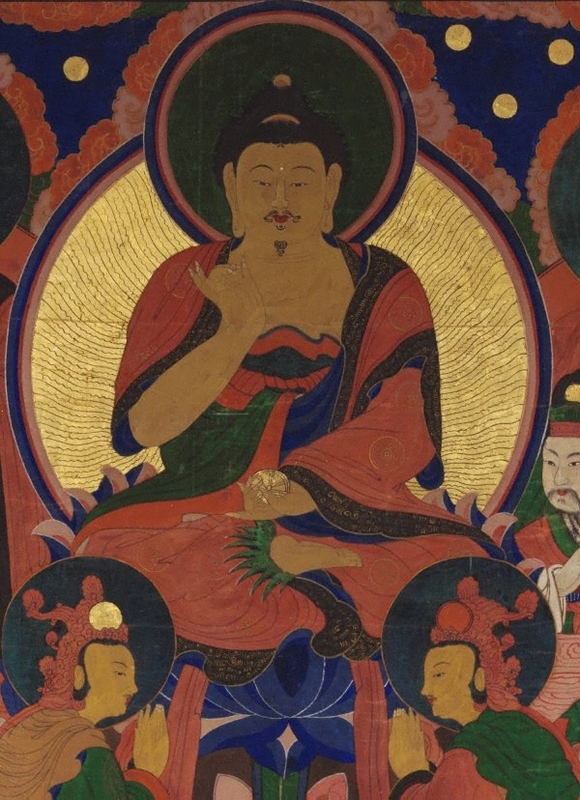 While it was the Mahayana school of Buddhism that permeated Korea, there quickly evolved a uniquely Korean interpretation in response to prevailing shamanistic beliefs. 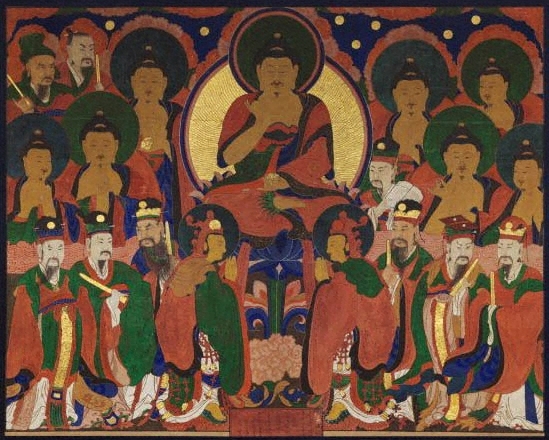 The absorption of shamanistic motifs and deities into Korean Buddhist imagery has created a pantheon unique to the Buddhist world, as can be seen in the Gallery’s painting. The painting is noteworthy for its authority, scale and colouring. Such large banner paintings (known as t’aenghwa) were popular from the 17th century and can be regarded as an extension of an earlier tradition of mural painting. They were usually created to hang behind the central Buddhist sculpture(s) on the altar of the main hall of a Buddhist temple, enhancing the power and glory of the sculptural image as well as the surrounding ambience of the temple interior. Regarded as the products more of a craft than a high art practice, such images were painted by monk painters, following a tradition whereby a novice monk evincing talent would be trained to paint the various images mandatory in the main and subsidiary temples of a temple precinct. By the time the Gallery’s painting was created, paper stencils were often used as the first stage in creating an image, with the ink outlines thus created then coloured in by selected monk painters. Typically the colours used were bright and flat, a taste arguably indebted to folk traditions, although undeniably effective for temple backdrops. In the Joseon period (1392-1910) details relating to the creation of a Buddhist painting were contained in a cartouche on the painting, a tradition that has been continued with the Gallery’s painting on which the cartouche at the centre on the bottom contains a cyclical date equivalent to 1931. This date puts the painting into the period of Japanese rule of Korea (1910-1945). Considering the Texan provenance of the piece one could conjecture either that Japanese took it to Japan from Korea, and that it then went to America during the Occupation, or that it was acquired directly in Korea by its previous American owner. The cartouche also contains the name of a temple, its town and province, as well as the name of the painter and the names of three donors, but further research will be needed to establish these details with certainty. The central figure, with his shimmering gilt aura, is the Buddha Amitabha, Lord of the Western Paradise ('Sukhavati' in Sanskrit) to which all followers sought entry in the next life. Seated on a lotus throne, he holds in his left palm a golden 'wheel of the Law’, the symbol of the 'Dharma' (the Buddha’s teaching), while the fingers of his right hand are in the gesture (‘mudra’) of teaching. Amitabha is flanked on the left and right respectively by his two bodhisattvas, Avalokiteshvara and Mahasthamaprapta, who symbolise compassion and wisdom, as well as the sun and moon which appear in their headdresses. While the central axis of the painting is devoted to the lotus-throned Amitabha and his two bodhisattvas, there are three horizontal registers to the painting. In the uppermost register are to be seen seven golden discs, symbolic of the Seven Stars, or the Big Dipper ('Ursa Major'), which in ancient Korea was believed to be the pivot of Heaven. Korean shamanism had a special reverence for the God of the Seven stars, known as Ch’ilsong, and the appearance of the seven stars in this Buddhist painting is evidence of the way Buddhism absorbed ancient Korean imagery to create a unique vocabulary for Korean Buddhism. 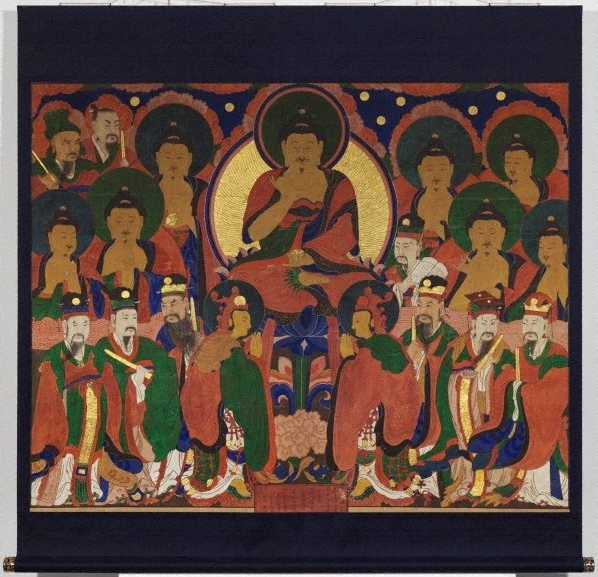 It may be that the seven buddhas surrounding Amitabha are allegories for the Seven Stars, since there is a distinct painting genre of the seven star spirits personified (known as 'ch’ilseungtaeng').The lowest register contains six bearded figures wearing official robes and holding sceptres, befitting their role as judges of the dead. While the lowest register serves as an anchor to the composition, space is undefined and limitless, befitting the depiction of a Buddha and his pantheon. Jackie Menzies, 'A Korean Buddhist painting from Texas', extract from 'LOOK', April 2009, pgs. 20-21.